It’s amazing how much your own culture can amaze you. You’re away from your own town, county or country for a while, and then you get back and you think you know what to expect. It is your own culture, right? But you’d forgotten about certain things and because you’d forgotten about them, they take you by surprise. I’m writing this from the comfort of my parents’ home in England. I’ve lived outside the UK for 13 years, and this is my first visit back to England in two years. When I arrived in the UK, three things about British society took me by surprise because I’d completely forgotten about them. One of these things was great and made me feel happy. One of these things was not so great and made me feel that some things need to change. So here is my account of the three things I noticed between the airport in Birmingham (the UK’s second-largest city) and Frome (the lovely town where my parents live). 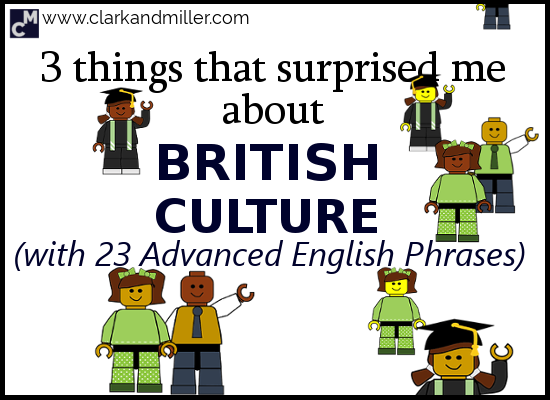 In this post, instead of me telling you how something works, you're going to read some very high-level English with lots of advanced idioms, phrases and words. You can find out what these new words and phrases mean at the end of the post, but don’t check immediately! Try to guess the meaning just from reading first. If you think you can figure it out, tell me in the comments. I’d love to see how you do. We had to wait in Birmingham for a couple of hours for our train to Frome. We went out to grab a bite to eat and have a sit-down. Then we were reminded just how multicultural Britain is. We ended up eating Mexican food at a place run by Bengalis that served both halal beef and beer. I guess the image that summed up the beautiful diversity of the country was when we saw a stall of pious Muslim guys promoting their religion, and two steps away a shirtless African drummer loudly drumming out an awesome rhythm with an ear-to-ear grin on his face. Two very different sides of human life side-by-side — the devout and the carefree, the reserved and the uninhibited. One thing that jumped out at us was just how institutionalised the UK is. You get the idea. They’re all over the place! What happens when the alarm rings? Seriously? I have to rush this? There was also a creepy recorded voice telling me to be quick as well or face a fine. Wherever we were, we were surrounded by chain stores and brand names. Everything around us felt like it was owned by distant billionaires in expensive suits. Possibly burning money for fun and laughing maniacally while stroking a globe. That’s their sort of thing, right? It was like the country was just a place for us to walk around in, but not participate in. Finally, in the train station and on the train, there were constant announcements telling us to make sure we had our tickets handy or to keep an eye out for dodgy characters (yeah, really, like in a dystopian future film), or not to leave baggage unattended. There was no way they were just going to let us sit back and enjoy the journey. They wanted us to be on our toes every step of the way. Surprise #3 — British Drunk People Can Be REALLY Loud… and Kind of Scary. For a Bit. But there are a lot of very different kinds of people around. On our way to my parents’ house, we took a train from Bristol to Frome. We were sharing the carriage with a bunch of inebriated lads taking the last train home after a night on the town. We’d forgotten quite how rowdy people like this could get. However, if you find yourself trapped in an enclosed space with drunk Brits, don’t worry. Their bark is worse than their bite and there’s (usually) no need to feel intimidated. They were just a bunch of guys letting off steam and having a bit of a laugh. It’s amazing how your own culture can surprise you and how easy it is to forget what makes up the society that you’re still a part of. OK. So I hope you enjoyed reading this as much as I enjoyed sharing it with you. I’m afraid there are no giraffes playing tennis or killer rabbits in this series of posts, but they’ll be back in August! Meanwhile, take a look at the phrases in bold and see if you can figure out what they mean. And let me know in the comments! ear-to-ear grin – a massive smile! “Big Brother” is a character in the book Nineteen Eighty-Four by George Orwell (I wrote about him here) about a government that watches everyone all the time. We now use this phrase to describe situations when we feel that the government is watching us too closely. Like with alarms in the toilet! laughing maniacally – laughing like a crazy person. A maniac! we had our tickets handy – We had our tickets somewhere we could get them easily. Another example? You want to make sure you have your passport handy when you’re going through immigration at the airport. keep an eye out for dodgy characters – Again, this one has two parts. The first one, “keep an eye out for something,” means that you need to be aware that something exists and that you might see it. Be ready to see it! “Dodgy” is a very British word that means “untrustworthy” or “dangerous.” We can use it for people and places. a bunch of inebriated lads – “Inebriated” means very, very drunk. A “lad” is another word for young man. a night on the town – This means a night out going to pubs, bars and clubs. And very probably drinking too much. their bark is worse than their bite – This idiom means that they aren’t as dangerous as they seem. letting off steam – getting rid of negative energy and stress. Personally I like to go to the gym to let off steam. The guys on the train liked to drink more beer than may humanly be possible. having a bit of a laugh – having fun! -Their bark is worse than their bite: someone making a lot of noise but he’s not dangerous. I tried to understand the meaning from the contest, I didn’t cheat, I swear! Only a couple of mistakes. Have a sit-down actually means to sit down, especially after a long walk. Ams I’m sure you didn’t cheat! hahahah I laughed at this so so much! I found this article worth reading. I’m from Chile and I lived in Edinburgh for a year while finishing my major. The “signal issue” is soo true, there were signs everywhere! and as a Latin guy I was shocked when I realized that most people in the UK respect the pedestrian signals, because in Chile we don’t, we just cross the streets even if the light is red lol Thank you so much for sharing this story, I’ve written all those expressions, I didn’t know some of them. You never stop learning idioms and expressions, don’t you? even more when it comes to English. Regards! Yeah it’s so true — we never stop learning idioms and phrases. Signs everywhere! We’re never free of them! Thanks for such an upbeat comment and I hope to keep you laughing! That was what I was aiming for! So glad you enjoyed it and found it useful. Keep up the good work! Yeah, I know! Crazy, huh? The only thing I can think of is that they were worried about drug users. But the thing is, it was in this very pretty, calm, rural town. I guess it’s just the “nanny state” at work. Which UK idioms do you find confusing? 1. grab a bite to eat: have a place to have a good meal. 2.have a sit-down: have a nap. 4.ear-to-ear grin: a broad smile on his face. 5.devout: very religious, somebody who lives according to the precepts of his faith. 6. carefree: a free spirit. 7. reserved: not openhearted, somebody who doesn´t want to show his feelings or opinions. 8.uninhibited: precisely the opposite to reserved. 9. jump out at us: stroke us; called so much our attention. 10. have our tickets handy: have our tickets at hand, near just in case we need them. 11.keep an eye out for dodgy characters: to be careful with ” funny looking”, “weird” people. 12. be on our toes every step of the way: to be controlling us all the time. 13. bunch of inebriated lads: a group of drunk guys. 14. night on the town: to party around the town. 15. I´m not sure. I think it should be something similar to “bully”. 16. their bark is worse than their bite : it means that they seem to be violent and dangerous but they aren´t so. 17. letting off steam: show off, I believe. 18.having a bit of laugh: Have a good time. Sorry, it turns out too long!! Great work. Your descriptions are really clear and well thought out. 2. have a sit-down: actually it just means to have a rest (usually sitting down). 12. be on our toes every step of the way: I totally see your logic, but it’s not the right answer. If you’re on your toes, it actually means you have to be alert and careful in, usually, dangerous situations. I’m glad it was long! You did well.